CIVIC CENTER — A proposed 1,147-unit apartment complex in Williamsburg has pitted two local city councilmen against one another, and led one of them to call the city's rezoning process a "racist" and "discriminatory" "sham." At stake is the redevelopment of 4.2 acres of land within the Broadway Triangle area that was formerly owned by pharmaceutical giant Pfizer. Developers from the Rabsky Group want to rezone to build apartments and commercial space, a move which City Councilman Stephen Levin argues would bring much needed affordable housing to an area that's been a vacant lot for decades. His fellow Councilman Antonio Reynoso, on the other hand, whose district is across the street from Broadway Triangle, said the rezoning ignores the history of discriminatory housing policies in the area and would perpetuate segregation between and the divided black, Latino and Hasidic communities on all sides of the triangle. 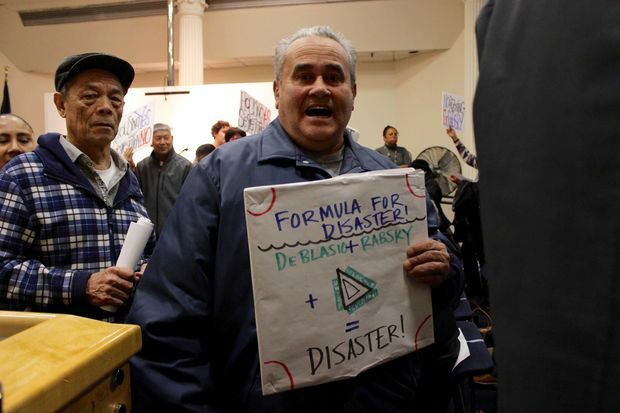 The two butted heads at a public hearing Wednesday morning hosted by the Department of City Planning in their downtown Manhattan offices, where activists backed by Reynoso briefly prevented it from starting with chants and marches and then moved into the lobby where they continued to jeer, often drowning out the speakers within the hearing. "The process itself is racist," said Reynoso who represents parts of Bushwick and Williamsburg across the street from Broadway Triangle. "This process is a sham. It's discriminatory." A pending lawsuit that has stalled the rezoning of city-owned land within the Broadway Triangle area, charges that the 2009 rezoning under former Mayor Bloomberg violated federal fair housing laws and favored the Hasidic community to the detriment of blacks and Latinos. Affordable housing development on the city-owned land is at a standstill because of the lawsuit, while market rate projects continue to sprout up. "This institution approved a discriminatory plan...based on race, which by any other terms would be called racism," Reynoso said, addressing officials of the Department of City Planning, explaining his and protesters' distrust of the rezoning process. Following his remarks, Reynoso demanded that the city stop the current rezoning process before it goes any further and work to settle the pending lawsuit. Joe Marvilli, a spokesman for the Department of City Planning reiterated that the site wasn't within the contentious area that the city had earlier approved for rezoning, though he wouldn't comment on Reynoso's demands. City Planning officials had rescheduled Wednesday's meeting for their offices in Manhattan after they canceled the first meeting in late September located within the Broadway Triangle, when protesters lead by Reynoso and other community groups chanted and marched for the better part of an hour refusing to leave the auditorium. Reynoso's opposition to Rabsky's proposed development has already taken a toll on other political efforts in other areas. After the first scoping session, city agencies abruptly pulled back from a Bushwick community-driven initiative to rezone the area they'd been working on with local advocates for more than a year, according to sources familiar with the issue and a letter sent to the mayor's office asking the city to return. Following the city's retreat, organizers at the Bushwick Community Plan abruptly canceled a public meeting they'd planned for mid-October and have yet to reschedule, though sources said they expected the city to return soon. Reynoso declined to comment on issues concerning the Bushwick community plan. Following his speech, City Councilman Stephen Levin who actually represents Broadway Triangle took the mic to testify, pleading with those listening to support the process if not the project itself. "We need to consider that we have laws for a reason," said the councilman, who'd earlier stressed the importance of affordable housing in the Broadway Triangle. "If a developer owns a piece of property and proceeds to apply for a rezoning this is the process." Protesters in the hallway responded with a chorus of boos audible from within the hearing room. "We can't just shut down government. That is is an abdication of our responsibility as citizens," he said. "I’m not here to testify in support of the project. I’m here to testify in support of the process." A spokesman for the Rabsky Group said the developer hoped to build affordable housing at the vacant site to benefit the community.